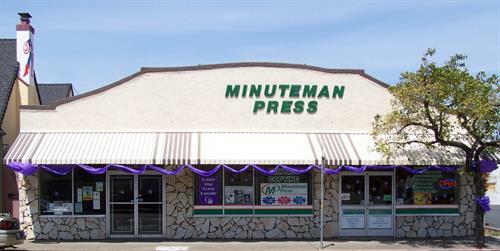 Since 1991, Minuteman Press of Vallejo has been a family-owned and operated Business-to-Business full-service print, copy and graphics center. We moved to our present location at 812 Tennessee Street in 2006. The move afforded us the opportunity to expand our capabilities to better serve our customers. With our state of the art Digital Printing and Offset Printing Capabilities, Professional Graphic Design, complete Bindery and Blueprint Services, we can offer you the Quality and Service that can only come from over 21 years of dedicated experience. Our products include brochures, business cards, envelopes, business forms, flyers, invitations, labels, letterheads, newsletters, postcards, and presentation folders. We also offer posters, banners & signs to fit our customer's needs. We can even help you plan your new marketing strategy with our Every Door Direct Mail program or the perfect complementary promotional products, as we offer a full range of pens, calendars, magnets and much more! Near the intersection of Broadway and Tennessee. Across the street from Kelly Moore Paint.